MedStar Georgetown University Hospital, a 609-bed academic hospital, is one of the nation's leading teaching and research hospitals. 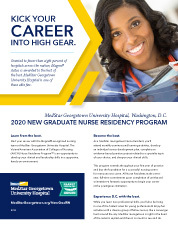 As Washington, DC's first Magnet® hospital and one of the few hospitals to receive Magnet re-designation, MedStar Georgetown University Hospital is deeply committed to your professional development. MedStar Georgetown University Hospital has been ranked by U.S. News & World Report as a "high performing" hospital for cancer, diabetes and endocrinology, geriatrics, gynecology, nephrology, neurology and neurosurgery, orthopedics, pulmonology and urology. MedStar Georgetown's centers of excellence include neurosciences, transplant, cancer and gastroenterology. 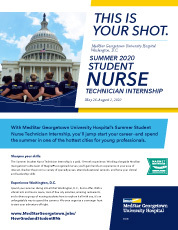 Along with Magnet® nurses, internationally recognized physicians, advanced research, and cutting-edge technologies, MedStar Georgetown's healthcare professionals have a reputation for medical excellence and leadership.